If you’re interested in learning more about our backloading interstate removal services, or if you’re looking to obtain a quote from us, get in touch with Transcorp Removals & Storage. Call us on 1300 466 838 today or simply request a quote using our quick online quote form. 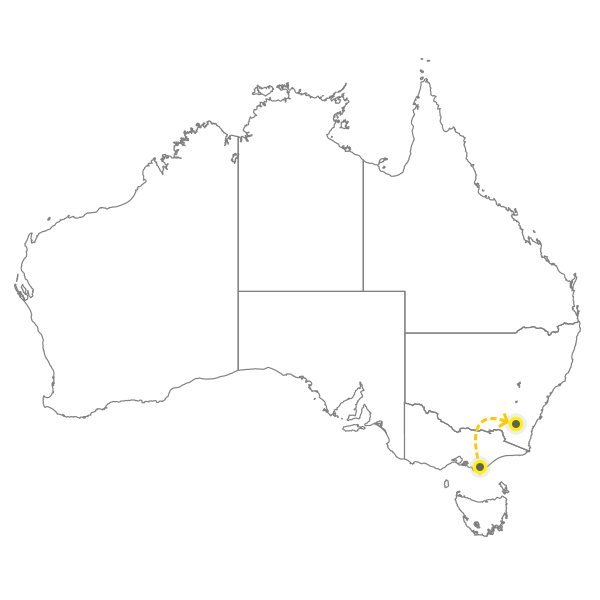 Backloading to or from Melbourne – How Long Does It Take? We can provide you with storage if necessary. Transit times are based on consolidation of loads. Depending on the volume of removals performed, we might be able to deliver even quicker than noted. If your interstate move is urgent, we can provide you with an exclusive vehicle or removal container to reduce your transit time if requested. There are times where utilising a local removal truck or shuttle van is necessary for areas with difficult access. Please notify your sales consultant. We regularly receive enquiries about whether or not we provide interstate vehicle transport. We are excited to share that Transcorp can organise a door to door service or depot to depot service for your vehicle. From motor vehicles and boats through to motor bikes, caravans and modified vehicles, we have professionals that can adequately provide this service. Dedicated to our customers, we offer an end to end service to ensure a smooth, hassle-free and enjoyable interstate move. We can also offer you a valet service at the airport for your car on arrival (subject to vehicle transit times). All of our vehicle transporting quotes include insurance protection for your peace of mind. Please speak to one our qualified representatives today for more information. Transporting pets is another service of ours. We understand that transporting pets can be a stressful ordeal, but we can put your concerns to rest with our trauma-free pet transportation. With 25+ years of experience in the field, we can arrange an end to end pet transportation service. Speak to our one of our qualified estimators to discuss your options and learn more about our safe, affordable and dedicated pet transportation services. If you’re looking to de-clutter your home, or if you simply need help unpacking boxes, Transcorp can help you do this quickly and efficiently. From china cabinets to kitchen supplies, our professional team can assist in packing and unpacking all of your precious items. From a minimum of 4 hours to however long you want, contact us today for a competitive quote and to discuss your options. When it comes to relocating to a completely different state, it’s likely that you’ll feel excited, stressed and overwhelmed all at once. Fortunately, you can tackle the job hassle-free with the help of Transcorp’s interstate backloading services. We operate in Melbourne and across Australia and are capable of carrying out successful backloading moves, with a team of experienced, passionate and fully qualified removalist experts. Boasting years of experience in the industry, we pride ourselves on carrying out moves that are stress-free, successful and completely satisfying. Our backloading rates are competitive and flexible, and we operate both rigid furniture removal trucks and shipping containers. Why Choose Our Removal Team?